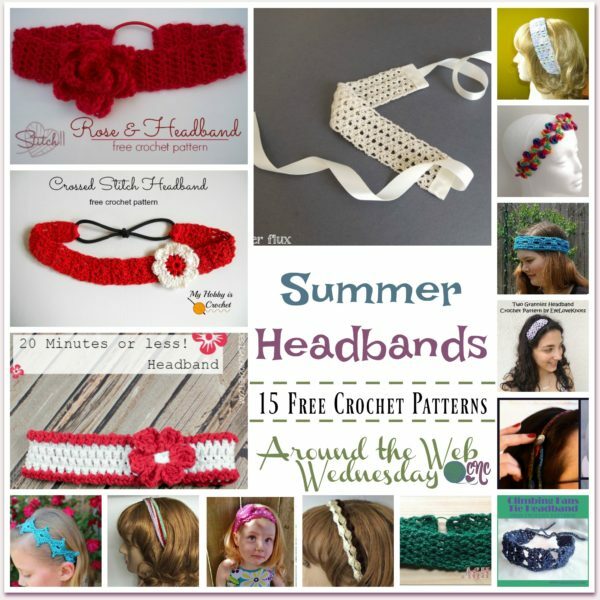 In this roundup you’ll find over 15 free patterns for crochet summer headbands. 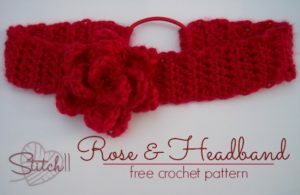 Many of these headbands can be crocheted to any size you want from child to adult. They make for great gifts for yourself, your daughters as well as for friends and family members. Plus, they don’t require much yarn, so you can whip these up with leftover yarns. 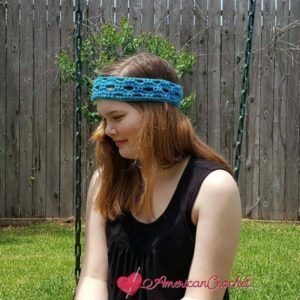 These summer crochet headbands are quick and easy to crochet, and can be made to match all your summer outfits. 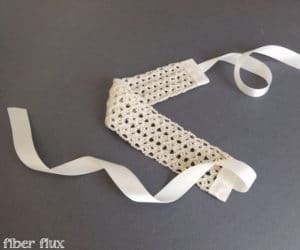 You can easily embellish them with the floating or picot flower. These buttons might also look great if done in a contrasting color. 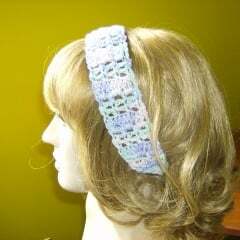 At this link you can find more crochet headbands. Or, if you’re interested in more crochet summer roundups you might enjoy these bags, or these summer tops and hats. 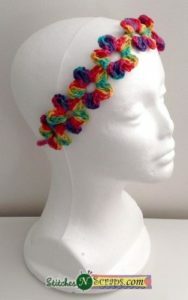 This headband is really cool in so many ways! It works up quick and makes for a nice stashbuster to have on hand. And, it’s a styling band that you can wear with just about any outfit and hair-do including both long and short hair. Every girl loves her diamonds. And now you can enjoy them in your hair at a cost that’s next to nothing. The pattern is available in one size, but will fit most children and adults. Roses are perfect for summer, or any season of the year! 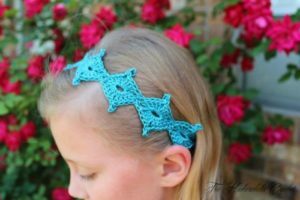 And this one here is sure to become a favorite as it’s a lovely match for the stretchy headband, but it can also be worn in many other ways. Next up, we have a lively flower design. It is adjustable for any size from child to adult. And best of all, it’s worked in one piece! I love how the puff stitches are staggered over the three strands of puff stitches. The pattern is easy to adjust to any size you want. 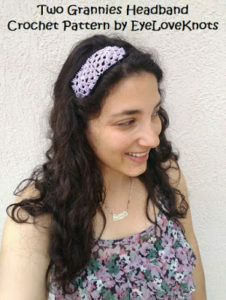 You will enjoy the simple lace in this summery headband. 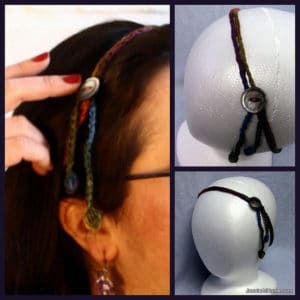 It’s great for keeping your hair back as well as for an added touch to your outfit. I love the idea with the elastic at the back, which allows for a nice comfortable fit. The pattern is given for an adult size, but can be modified to fit any size you need for children as well. If you love simplicity, then this one is for you! 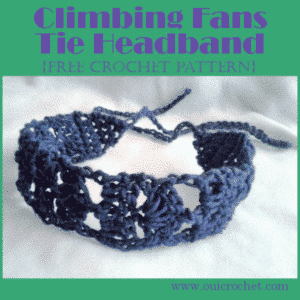 It’s quick and easy, and also comes with a necklace pattern to complete any outfit. The lacy fan stitch makes this one perfect for hot summer days. The pattern here is a repeat over four rows, making it super easy to crochet this to any size you need. This one is perfect for beginners. It has a nice stretch and ties at the back for a comfortable fit. Quick and easy is key when it comes to your summer holidays, as the more time you save crocheting, the more time you can enjoy doing other fun summer stuff. 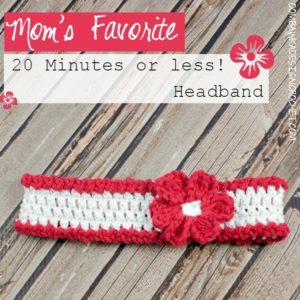 The quick and styling band can be crocheted to any size you need. This beautiful lacy headband is perfect for summer weddings. And it’s available in all sizes from newborn to adult. Here is another one that is perfect for weddings or any other special occasion. 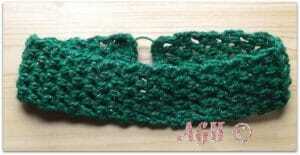 Forget the name of this band as it can be crocheted in any colors and for any season. The size is given for child to adult, but can be adjusted as needed. 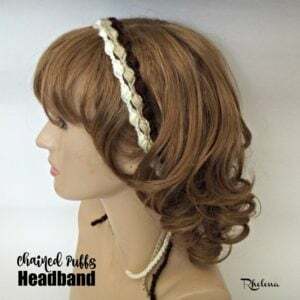 This headband pattern gives you two options… one is to wear it in three strands as shown, and other is braided for a totally different look. 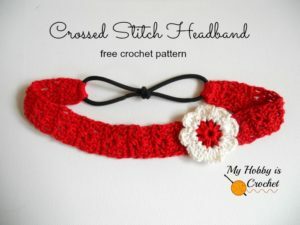 If you enjoyed these free crochet patterns, you might also enjoy a browse through the many headband patterns available on CPB: Crochet Headbands.